In 2012, as Hurricane Isaac approached the Louisiana coast, the residents of LaPlace, Louisiana (a community of 3,000 people near New Orleans between the east bank of the Mississippi River and Lake Pontchartrain) felt relatively safe from floodwater. They were reassured because they had never flooded before: they came through Camille, Katrina, and Rita, and everything in between, and had never had any water. Emergency managers were also well aware of the town’s historical record of staying dry during major storms as they performed their flood fighting duties throughout the region. However, past performance is not necessarily a predictor of future events. Each storm is different; the size of a storm, its track, and its speed are just as important as the storm category when it comes to flooding. As it turned out, Isaac’s slow motion and last minute turn to the west were going to push water from Lake Pontchartrain west into LaPlace for the first time. 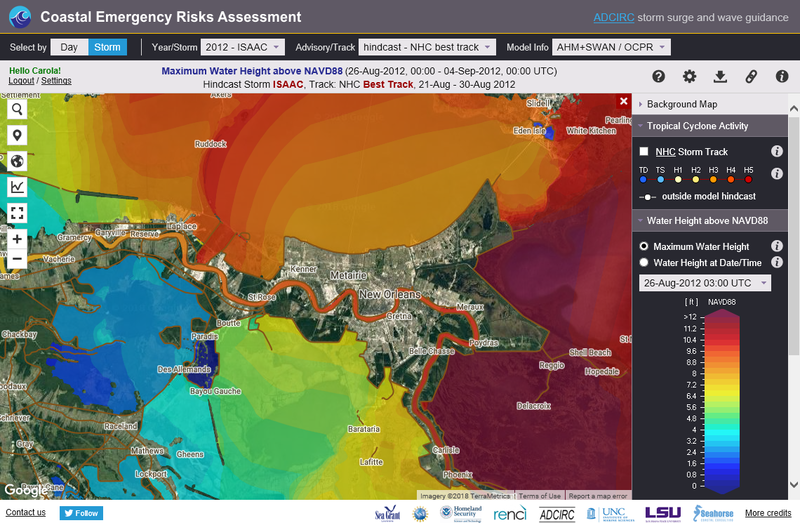 ADCIRC was the only model that predicted this flooding, and we continuously updated live storm surge guidance on the CERA site for official decision makers in southern Louisiana. Unfortunately, the live storm surge guidance for LaPlace got caught up in the whirlwind of data that confront emergency managers in disastrous weather events, and did not attract sufficient attention. On top of that, the comforting memories of dry homes during historical hurricanes allowed the community of LaPlace to remain in a posture of watchful waiting, rather than active evacuation. In the middle of the night of August 28th, waters from Lake Pontchartrain surged west, flooding homes and businesses in La Place, and necessitating an emergency evacuation of over 3,000 people from the area. Impact analysis with ADCIRC showed that 30% of the homes in LaPlace received 2-4 feet of floodwater and the radio tower just south of I-10 received upwards of 7ft of flooding. During this event that radio tower went off line but could have been saved if active measures had been taken to sandbag it. Our goal is to be able to inform emergency managers about the potential impacts of the storm surge in terms of consequences. At the same time, we have moved beyond predictions to damage assessment, providing the most accurate maps available in the immediate aftermath of a storm. Emergency managers use these maps after a storm makes landfall to guide rescue operations and repair crews to provide help where it is needed most.